CLS Knights Surabaya landed 25-year old American forward Stephen Hurt (211-120kg-93, college: Kansas State). He played most recently at Al Rayyan in Qatari D1 league. In 13 games he averaged impressive 17.2ppg, 11.2rpg (#4 in the league), 3.4apg and 1.3bpg last season. It was a very successful year in his career as he was selected to Asia-Basket.com All-Qatar D1 Honorable Mention. The most of previous (2016-17) season Hurt spent at Hopsi Polzela (Liga Nova KBM) in league where in 14 games he had 9.6ppg and 4.1rpg. He helped them to make it to the Slovenian Cup Semifinals. 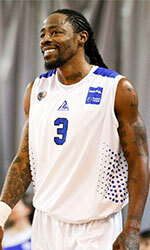 Hurt also played for Lapuan Korikobrat (Korisliiga) in league. In 9 games he recorded 6.7ppg and 4.1rpg. Hurt received All-A-Sun Freshman of the Year award back in 2013 at his college time. Hurt graduated from Kansas State in 2016 and it will be his third season in pro basketball.